Lewis Hamilton (1st): "I'm delighted to claim my 50th career victory today, it's been a long time coming, but most importantly it was great to have a solid race weekend. This race has always gone extremely well for me, but still, it was a massive relief when I crossed the line given my reliability issues in recent rounds. I was 100% clear on my start and I knew it was going to turn out that way. It was a nice feeling, especially after so many ups and downs, and I was able to control the race from there. It's been great to be back here in Austin and the response from the fans has been incredible. The aim is to continue this form next week and I can't wait to continue the Championship battle in Mexico." Nico Rosberg (2nd): "I had a good start and tried to overtake Lewis on the outside but ultimately it meant Daniel Ricciardo had a better line out of turn 1 and was able to capitalise on this. From there it was hard to overtake the Red Bull but our altered strategy paid off. We ran the medium tyre and that gave us plenty of options, especially when the virtual safety car came into play. The medium tyre showed some really strong pace and the car felt great which meant towards the end I was closing in on Lewis, but it was too late. He did a better job this weekend and deserved the win and I look forward to continuing our battle in Mexico." Paddy Lowe: "It's a terrific result at what's becoming a really special race on the calendar and Lewis Hamilton is proving to be a popular winner here. It was a really well controlled race from Lewis, he didn't put a single foot wrong and keeps the drivers' championship battle alive going into the final three races. For Nico it was slightly more difficult, losing position to Daniel Riccardo at the start. We had strategic opportunities to move him back up to second but it was made a lot easier by the virtual safety car at a very convenient moment: good for us although it denied the fans an exciting battle. That's another fantastic job from the team here in Austin and back in Brackley, Brixworth and Stuttgart and we look forward to Mexico in just a few days, where yet more great racing is to be expected." Toto Wolff, Technical Director: "This race in Austin in becoming real Lewis Hamilton country: three wins in a row, and four in total, after a perfect and really controlled drive today. We have had some pretty dramatic races in recent weeks, including what happened in Malaysia of course, so it was good to have a drama-free afternoon today and see Lewis put in such a strong drive. As for Nico, he's in a tricky situation right now because he knows he cannot afford to have a DNF. Probably that was part of why he lost position in Turn One, but then he was looking good to get back to P2 with an offset tyre strategy before the VSC meant we could pit and gain the position in that way. It was also great to see our pace today: things looked much closer with Red Bull in practice but our engineering team did some good work on Friday night and we had a nice advantage in qualifying and the race. We move on to Mexico now and our focus, like this weekend, will be on providing the boys with two reliable cars so that they can continue this championship battle in the right sportsmanlike way, between them out on track." Sebastian Vettel (4th): "Overall today was a better day than yesterday, it was a good race. The start was not so good and into turn 1 I was quite lucky, given that somebody was hitting me, I think it was Nico Hulkenberg. Luckily nothing was broken so I could carry on. Then the pace was good, we were looking after the tires, so we could go longer than other people. The race was a bit different than we expected, we got a present from Max today but unfortunately also Kimi had some problems and had to retire. It could have been a good performance for the team with both cars in the points." Kimi Raikkonen (DNF, Wheel): "Obviously the end result of this race is far from ideal. It's a pity because the performance of the car today was good. When we changed for Soft tires, for whatever reason I seemed to struggle. The balance was ok but I never really had the grip I was expecting. Once we went back to Supersofts the car was good again. When I left the pits after the third pit stop I slowed down a bit and asked if everything was ok because I saw some sparks coming out. At the end of the pitlane the team told me to stop. Now we have to understand what happened, the rear wheel nut had not fitted properly." Maurizio Arrivabene, Team Principal: "Obviously, we had hoped for a better result this weekend. Once again, though, we paid a heavy price for our qualifying position. In the race, our pace was definitely better than yesterday, and we could have fought for a podium finish. Now we move to Mexico straight away, and we will put our maximum effort and concentration into the next racing weekend." Felipe Massa (7th): "I had a really good start and the race was going fantastically. I avoided the incidents at corner one and managed to overtake two cars. Our pace was really good and I managed to open up the gap to the cars behind. Then I was really unlucky with the virtual safety car because I was nine seconds ahead and then Sainz came out in front of me, gaining a lot of time and points. At the end, Fernando dived into the corner I was taking, hit my car and I got a puncture because of it. It destroyed every opportunity I had to finish the race in sixth, and potentially fifth. We still finished seventh and closed the gap to Force India, but it should have been more. It's time to look ahead to Mexico." Valtteri Bottas (16th): "It was a very disappointing day today. I went into turn one on the inside and had a good line for the corner, but at the apex Hulkenberg touched me and I got a puncture. That also damaged the floor of the car and I lost a lot of downforce for the rest of the race. I'm happy there is another race coming quickly next week in Mexico to try and make up for this. The positive thing is that we narrowed the gap to Force India a bit, but we need to make sure that we score good points with both cars." Rob Smedley, Head of Performance Engineering: "The key factor today was that Valtteri was out of the race effectively from the first corner after having to limp back to the pits with a puncture after an incident with Hulkenberg. After that, we just tried to concentrate on Felipe. He had got himself into a good position and we created a decent gap to Sainz in the first stint. We then had a good pitstop and strategy, and kept a good gap to Sainz on the option tyre, so we were in control of our race. However, the virtual safety car caused by Verstappen put us at a disadvantage and allowed Sainz to get ahead. We were then just waiting for his tyres to degrade when Alonso caught up, and collided with Felipe as he tried to get through. The car could have secured fifth today but circumstances went against us. However, we will be back in seven days' time and will continue to close the gap to Force India in the championship." Daniel Ricciardo (3rd): "In the beginning of the race the supersoft tyres helped me but the actual start I felt wasn't really that much better than the Mercedes. Then I saw Nico going to the outside so it gave me an opportunity on the inside. Obviously I would have loved to have lead out of Turn 1 but second was good enough. I tried to stay with Lewis the first couple of laps but then his soft tyres were able to go a bit better. I think we were looking good for P2 but then the Virtual Safety Car didn't work in our favour today. I'm not going to be too disappointed, it's just cool to be on the podium here. I love coming here, the anthem was pretty awesome before the race, I had goosebumps, I'm not gonna lie, and then the podium after was great. It's another big bag of points and we at least had Nico's pace so that's encouraging and we'll try and do what we can in the next few days. Obviously Max and Kimi had their misfortunes today so it was just me and Seb out there, but we still gained a little bit on Ferrari so we're looking good. We'll try and keep going like this and get on the podiums for the last few races." Max Verstappen (DNF, Engine): "It was a very unfortunate way to end the race, especially as the first part was so positive. The start was OK, being on the harder compound means it is always going to be tricky but we managed to get away and stay in front of Seb. I was happy with the pace and I felt good out there, it was a nice battle with Kimi who I was glad to pass. I'm sure there was the ability to race the Mercedes today but it is just very hard to pass them due to the straight line speed. I backed off Nico in the end to save my tyres and maintain the gap from the Ferrari. The pit stop issue was my misunderstanding, the team had asked me to push the lap before so I thought I was going to be coming in. I pitted and then realised they hadn't actually made the call, luckily it didn't affect the end result. Shortly after I had come back on track I heard a banging noise coming from the engine so I pulled the clutch, they then asked me to release it again and keep going so they could try and work out what it was, unfortunately we couldn't solve it and it ended my race. At the end of the day the race pace was good and the setup felt strong so I am positive and looking forward to Mexico next week." Christian Horner, Sporting Director: "Taking away a podium finish and extending our lead over Ferrari in the Constructors' Championship to 53 points are positives. A DNF on Max's car due to a gearbox failure is a negative out of today. But Daniel drove an excellent race, he did everything he could, he got the track position at the start with the softer tyre and held that through the first round of pit stops. Unfortunately the Virtual Safety Car (VSC), ironically caused by the issues with Max's car, gave Nico a free stop and track position on Daniel. Without that we would have had track position on Nico, who would have had a softer tyre available to him, but it would have been a fight on the circuit between the two guys rather than dictated through the VSC. So all in all, positives to take out of this race and we look forward to the Mexican Grand Prix in one week's time." Sergio Perez (8th): "Eighth place was a good recovery after our race was compromised on lap one. I was hit hard from the rear under braking for turn 11 by Kvyat, who made a mistake and came in with no control. All of a sudden I was effectively in last place and with a badly damaged car. It was a difficult recovery, but step by step we got back into the points and in the end we didn't get a bad result. We got all the strategy calls right and this helped us overcome the damage to the car because we made up positions in both pit stops. To come away with four points and to move up to seventh in the drivers' championship is a good result in these circumstances. It's important to hold on when you get a difficult weekend, especially in races with high attrition, and score every point you can get, but the regret remains because I think we could have finished fifth today." Nico Hulkenberg (DNF, Damage): "It's really disappointing to have another first lap retirement. I just ran out of space going into turn one because I got sandwiched between Valtteri [Bottas] on my left and Sebastian [Vettel] on the right. Sebastian turned in quite aggressively, made contact with me, and that pushed me into Valtteri. I think it could have been avoided if Sebastian had given us a bit more space, but it all happened so quickly and I had nowhere to go. It's really frustrating when you have a quick car and your race only lasts ten seconds. We had done all the hard work on Friday and Saturday, but all that effort counted for nothing." Robert Fernley, Deputy Team Principal: "We had a pretty disastrous first lap - not for the first time this year. Nico was eliminated in turn one as he got squeezed between Bottas and Vettel. The resulting contact broke the steering arm and forced us to retire the car. Later in the lap, Sergio was hit by Kvyat going into turn 11 and he dropped to the back of the field. Despite picking up damage to the floor, he staged a remarkable recovery drive to finish eighth. To be leaving Austin with just four points is disappointing, especially considering the speed we had in the car this weekend. That said, we've only dropped a couple of points in the fight for fourth place in the constructors' championship and we take encouragement from the car's competitiveness across the weekend. It means we can go to Mexico confident of delivering a similar level of performance." Kevin Magnussen (11th): "We started with the plan for a one-stop strategy but we quickly realised that it wasn't the best option so we swapped to a two and finally a three-stop strategy. It was tougher on tyre wear than we predicted but that did mean I was able to have some fun at the end of the race on the super soft tyres - it was the most fun I've had in the car all season, being able to push hard to the chequered flag. It was a pretty decent race considering our qualifying position. The penalty is frustrating, but that's racing sometimes." Jolyon Palmer (13th): "I had a slow start and unfortunately lost a few places that allowed Kevin to pass me, which then meant I was on his gearbox for a good two-thirds of the race. We were really struggling to follow other cars and although I was quicker, I couldn't get close enough to pass which was so frustrating. I could have tried to lunge but that's not a clever thing to do between team-mates. In the end, I overheated my tyres trying to overtake and fell back a little bit." Fred Vasseur, Team Principal: "I'm in two minds about today's Grand Prix. I'm happy we were able to adapt our strategy well as the race evolved, however at times our race pace was not as consistent as we'd like. In our first stint we didn't seem to make good progress, yet at times we did see both cars deliver decent lap times considering their respective tyre conditions. We will be very vigilant in our post-race analysis to understand where we can better maximise our opportunities in the future. We finished just shy of the points today, but in the points is where we want to be." Carlos Sainz (6th): "Today's result is a very special one for myself and the team, it's a top, top, TOP result!! What a boost and what a way to motivate the team and keep our heads up until the end of the season! I don't know what this track has, but I just get such a good feeling every time I race here! It's a weekend I will always remember! To equal my best result in Formula 1 makes me very happy, but this P6 is a bit more special than the one in Barcelona because here we didn't think we really had the car to do so - our simulations before the race said we would only finish in P11 or P12 and here we were, fighting for a P5! We were able to make the tyres last during the first stint, staying close to the Williams and then managed to create a good gap to Fernando on the Softs. We also got a bit lucky with the VSC period, which was great news for us, as we were suddenly in front of the Williams. We knew it was going to be very difficult to get to the end on the Soft tyre, but we committed to that and went to the end on that set - during the last two laps I had no tyre left and just had to hold on to it as best I could! The battle with Fernando was so much fun! I knew that he would end up getting past me but I said to myself, 'let's make it a bit complicated for him!' I perfectly know how he attacks and how to defend against him, as I've been watching him race for the past 12 years... And I think that to be able to keep him behind for all those laps until he just opened the DRS and said 'ciao, ciao' was pretty decent! I'm so pleased, so happy, you just can't imagine what's going on inside me now, even if I'm not showing it on the outside, I'm delighted! I will definitely celebrate with champagne tonight, for me this feels like a win!" Daniil Kvyat (12th): "Quite a tough day for me today. I think I had a good start, but we then had to switch to a one-stop race after getting a 10-second penalty for my incident with Perez during the first lap. This compromised our race and it wasn't easy to make it work, but we tried our very best and kept pushing until the end. I have to say we did a very long stint on the Medium tyre and the management was very good. It's just a shame that we lost the opportunity to fight for some more points today." Franz Tost, Team Principal: "Carlos started from P10 and was very clever in the first corner, defending against others very well - especially Alonso - and at the end of the first lap he was already P8. From then on he drove a very clean and competitive race as well as managing the tyres in a very impressive way. Towards the end of the race he was racing in P5 and was able to defend this position until the very last laps against Alonso. In the end the McLaren driver was able to get past him, but we can't forget that we are much slower on the straights and therefore Carlos had no chance to defend himself. Today he also did a great job when Massa was attacking him, so Carlos really showed a solid performance: he deserves this P6, it's one of his strongest races with the team. Regarding Daniil, after the start he collided with Perez, resulting in his front-left wing endplate getting damaged. He therefore lost downforce and, consequently, performance. He was also given a ten-second penalty for this, which compromised his race and was only able to finish P12. Generally speaking, the team did a very good job and the cars were more competitive than expected. We are now looking forward to the race in Mexico in seven days' time." Marcus Ericsson (14th): "I had a good start moving up to P13 after the first lap. It was a tough beginning to the race with some nice fights. On the soft tyres I had a decent pace. Then we decided to take a gamble and went for a one stop strategy. We knew it would be tight, but we felt that was the only chance to score a point. Therefore, my second stint on medium tyres was a long one, and so it was too difficult to keep the pace up in the end. All in all, it has been another decent weekend as we are taking steps in the right direction. We need to continue with that next weekend in Mexico." Felipe Nasr (15th): "Starting from the back we decided to choose the medium tyres for the first stint. I tried all I could to keep the car on track at the beginning of the race, as I had low grip on that tyre compound. As soon as we saw the data, we knew that we could extend the stint and switch to a one stop strategy so I did my best to stay out on track as long as possible. Because of the one stop strategy, I was able to recover some positions in the end." Monisha Kaltenborn, Team Principal: "We have to choose different ways to get us in a position to score points. The strategy as well as the performance of our drivers was good. The team faced the difficult challenges well and put in a solid performance. Although we haven't scored a point yet, we are heading the right way. I want to thank the whole team for their efforts." Fernando Alonso (5th): "It was good and interesting today, I enjoyed it, especially the final part of the race. 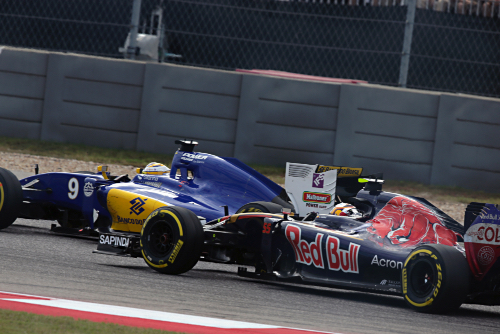 Carlos [Sainz] was on a different strategy and different tyres to me and Felipe, which allowed us to close the gap. Our tyres were in better condition than the Toro Rosso's and we took advantage of that. The last couple of laps were very intense, as we had some extra speed so we tried hard to overtake. It was quite easy to overtake the Toro Rosso as they're slow on the straights, so you just need to open the DRS. I was following Carlos for 45 laps and he drove very well, very consistently, zero mistakes - so we had a great battle. Our result today is nice for motivation, so I'm happy with fifth, but we gained a couple of positions because of other people going out, and our pace hasn't been great all weekend here, so we need to understand the reasons for that." Jenson Button (9th): "I'm pretty happy to get into the points after a frustrating day yesterday. The start was a bit of a crazy mess - there was so much action. Starting 19th makes your race a little bit more difficult but I had a good first couple of laps which I really enjoyed. I made up a lot of places and then fought my way into the top 10, and then I fluffed up my second pit-stop a little bit where I lost a place to Checo [Perez], but I think he would have got past me anyway. The second half of the race for me wasn't as exciting - I was looking after the tyres, judging the gap behind me, and trying to save the tyres to the end of the race to attempt to catch Checo, but I think I was about three seconds off at the end. I came home ninth which isn't too bad, and it's great to get some good points for the team on both sides of the garage. Fernando did a fantastic job to get to P5. He was very quick today, and the Safety Car helped him a lot - one day we'll get that luck too! I made some strong overtakes - some good, clean scraps - especially into Turn One, and I had a lot of fun fighting my way through, which made it a lot more enjoyable. For the rest of the season, it's important that we work on our Saturdays - trying not to make bad decisions and qualifying closer to the top 10, which means you have a lot more to fight with. Hopefully the next race in Mexico City will be a good one - I'm already excited about it - and hopefully we can get a good result there." Eric Boullier, Racing Director: "It's always very satisfying when a great grand prix takes place in a country in which it's important that Formula 1 increases its following, and that's exactly what happened here in Austin, Texas, today. We saw exciting wheel-to-wheel battles up and down the field all afternoon, many of them involving our drivers. Fernando drove a storming race from 12th on the grid to fifth at the flag, forcing his way through the field with a series of brilliant passing manoeuvres; and if he has a rival for the 'driver of the day' accolade, it can only be Jenson, who blasted his way from P19 at the start to P9 at the finish. I'm proud of both of them, as are all of us at McLaren-Honda. It was gratifying to see that, despite our disappointing qualifying form yesterday, today, as we'd hoped and indeed predicted, our race pace was significantly more impressive, allowing our drivers to enjoy themselves enormously. You only had to look at the way our car changed direction to see how good its chassis is becoming. I also want to commend our partners Honda, whose power units ran flawlessly all afternoon. So today was a good day, undoubtedly. And I hope it was enjoyed by not only the tens of thousands of race fans who packed the grandstands to the rafters, but also by the tens of millions of race fans who watched the race at home, presumably on the edges of their seats." Yusuke Hasegawa, Honda: "It was a good United States Grand Prix for us today. Before the start it was extremely difficult for us to predict where we would be at the end of the race based on the qualifying results yesterday, but we knew that our race pace would be better and stable. Today, both of our drivers proved why they're worthy world champions. It was good to see such strong driving, and undying racing spirit from both. Fernando pushed hard until the last lap, enabling him to finish in P5 behind the Ferrari, and a brilliant push from Jenson saw him gain 10 places to finish in P9. A double points finish is a great result to bring momentum back to the team." Pascal Wehrlein (17th): "All things considered, I'm really pleased with my weekend here. There were some challenging moments, but I'm happy with how we overcame those to have a good qualifying and now race today. The race itself was very straightforward. I think we got the most from the car, so given that I missed quite a bit of track time, it was a good result. It's definitely one of my favourite races of the season so far. We found some time to do some really fun things with the team, at the same time as working hard for the racing, so overall it's been a great weekend. My thanks to the team and I hope we can continue like this into Mexico next week." Esteban Ocon (18th): "It was a great start. I gained six places I think. Obviously, I dropped back gradually through the lap and then the tyres were sliding around quite a bit. I don't think it was such a good idea to start on the Medium tyre, but even so, the early part of the race was good. Yes, it seems that I picked up some damage that affected the balance. The team spotted something in the data and we tried to manage the situation, particularly during the pit stops, but it was harder to drive the car and in the end I was just pleased to get to the finish. I was hoping for something more but it was good to get both cars home at least, to reward all the hard work by the team." Dave Ryan, Racing Director: "A strong performance from both drivers today to achieve another two-car finish and manage our championship position. Pascal carried the momentum of a good qualifying forward into today and drove a tidy race. With Esteban, he did really well at the start and it was such a shame that the rest of the race was made difficult when he picked up some damage. Another back-to-back turnaround now and on to Mexico next weekend." Romain Grosjean (10th): "It didn't go too badly today. It was a bit of a messy first lap, but I managed to get through everything. Then we went with an aggressive strategy trying to go for it. That worked out pretty well, so I'm happy with that. We were lucky that a few cars retired in front of us but, in the end, we needed to finish the race. It's great to score a point in front of our home crowd. I'm very pleased with that and for the guys, as well. It's been a long time since we scored. It's obviously a great thing to be able to score points at the end of the season." Esteban Gutierrez (DNF, Brakes): "Quite a disappointing home race. I really want to thank everyone for all of their unconditional support as we really wanted a better result here in Austin. It all started well, optimizing everything we had in qualifying, and we got off to a great start in the race. The first stint was very strong and we managed to get into the top-10, fighting hard and pushing to the maximum. Unfortunately, a brake problem ended our race. It's not what we wanted or expected to happen, but we need to continue working very hard as we head to Mexico." Guenther Steiner, Team Principal: "Half a happy ending to a tough U.S Grand Prix. Romain in the points is fantastic, especially from where we started and how we were struggling at the beginning of the weekend. Very unfortunate race for Esteban. He was doing a good job when he experienced a brake disc failure again. We'll be investigating what happened and see how we can move forward and sort these problems out, as they are not acceptable. Romain couldn't race any better with the car we had, so congrats to him. The strategy, which the guys worked on overnight, was just right and it certainly paid off. The team worked hard and really pulled together. We had a difficult Friday and Saturday but we don't give up. We are racers."